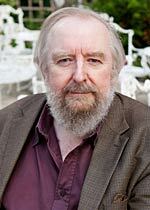 Michael John Moorcock (born 1939) is a prolific British writer primarily of science fiction and science fantasy who has also published a number of literary novels. His most popular works by far have been the Elric novels. As editor of the controversial British science fiction magazine New Worlds, Moorcock fostered the development of the New Wave in the UK and indirectly in the U.S. He won the Nebula Award for his novella Behold the Man,which tells the story of a time traveler who takes on the role of Christ. He has also won the World Fantasy Award, the British Fantasy Award, and many others, and in 2008 was named a Grand Master by the Science Fiction Writers of America.